What does Low E Glass do in replacement windows? How does Low E Glass really work? Do you remember going to Grandma's house and in that one back room on the West side where all the junk was she had foil over that window? You might have even asked her why she did that. The truth is it worked for getting heat to stop pouring through that old window. Now to be honest it didn't look good from the inside or the outside but it did do the job of keeping heat out. Modern technology capitolized on the concept. First with window tint when in was single paned windows, and later with Low E Glass. Quick disclosure here: Never put window tint on a double paned window unless you've made sure it is the kind that works in that application. Usually typical window film will cause a heat build up between the two panes of glass and cause seal failure, especially in West facing windows with high exposure. Sometimes window tint will blow the seals within a matter of months due to the heat build up between the panes. It actually melts the sealant that is supposed to keep moisture out from between the two panes of glass. Modern Low E is actually very thin sheets of metal poured at the time of the glass manufacturing and it is poured so thin that it's transparent. This thin metal film is several different types of metal and actually conducts electricity. You can use an electrical tester to see if you have the Low E coating on the correct side of the glass during the assembly of the glass double paned unit. The Low E coating is always supposed to be on surface two. That is the inside of the outside pane of glass. Glazing the unit incorrectly can ruin the seal, have a reverse effect or oxidize when exposed to the elements. To be candid, this was the main problem we had with American Craftsman Windows when we did the Home Depot contract for several years. They seemed to regularly build the glass with the Low E on the outside of the window (surface one). They replaced a lot of glass as a result. Also better manufacturers will grind off the Low E coating in order to assure a good seal where the spacer bars and the sealants are applied. 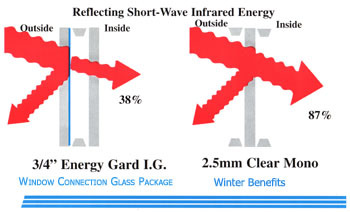 In the winter, Low-E Glass is designed to work in two ways: First, it transmits the sun's shortwave energy. This means it allows the sun's energy (which provides visible light and invisible heat) in through the windows, which helps heat a home in winter. Second, once the sun's heat is inside a home, the coating works to reduce the amount of heat transferred through the glass to the colder exterior. As a result, less of this heat, as well as the heat produced by a furnace, is transmitted back through the glass to the outside, helping to reduce heating bills in winter. Heat Conduction through builders grade windows. In the summer, heat enters a house through ordinary clear glass to the cooler interior. This happens in two ways: first, through direct shortwave sunlight; and second, by long-wave radiation generated by sidewalks, driveways, and other elements which have absorbed heat from the sun. 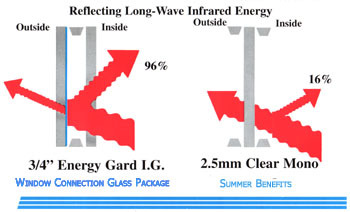 Low-E Glass effectively reduces this unwanted radiant heat gain by reflecting a significant portion of long-wave radiation back to the outside, helping to keep homes cooler and reduce cooling costs in summer. Low-E Glass reduces heat loss to the cold outdoors by dramatically reducing radiant heat transfer and actually reflecting interior heat back into the room. This means that your furnace heat is actually reflected back in towards the house as opposed to its natural tendency to move towards the cooler air outside. Unlike the gray and bronze tinted glass of the past (Low-E Glass allows more of the sun's rays to enter a home as solar energy to be converted into usable heat in winter. The same effect of keeping interior heat inside in the winter helps reduce the flow of hot outside air into the cooler interior in summer. The bottom line is that Low-E Glass helps reduce the number of heating and cooling Btus needed to keep a house at a comfortable temperature. That means furnace and air-conditioning systems work less, and that can add up to significant energy savings. Low-E Glass significantly reduces transmission of the sun's damaging ultraviolet rays, one of the leading causes of premature fading and degradation of fabrics, upholstery and carpeting. Consumers want comfort and savings. No one enjoys sitting near a cold, drafty window in winter. Low-E Glass works to raise the inside glass surface temperature in winter, to help minimize cold spots and keep homeowners more comfortable. Since Low-E Glass helps keep the inside glass surface temperature warmer, homeowners can enjoy a more comfortable, higher humidity level with greatly reduced condensation and fogging. Because Low-E Glass is an energy-efficient, high performance glass, architects, builders, and homeowners have the freedom to incorporate larger window and glass areas in their designs, without the resulting excessive energy costs. Todays' Low-E Glass is color-neutral. Homeowners can enjoy the great looks as well as the great performance of windows made with Low-E Glass. Our Google Plus page has lots of pictures and our recent vinyl replacement wndow activites in the field. See our videos on replacement window installation, caulking and trim. More than 30 people a day come watch them and they've been seen more than 75,000 times across the country.